The Filler Lab represents at the 2018 Fall MRS Meeting! Recent work from the Filler Lab was on display at the 2018 Fall MRS Meeting. Amar Mohabir talked about his work on Si/Ge nanowire patterning, Maritza Mujica presented her work on the Geode process for large-scale nanowire production, and Gozde Tutuncuoglu discussed her studies of thermal transport in Si nanowires. Prof. Filler was a co-organizer of Symposium NM03: Nanowires and Related 1-D Nanostructures where this work was presented. The team also left time for a little fun and to meet a few lab alumni! 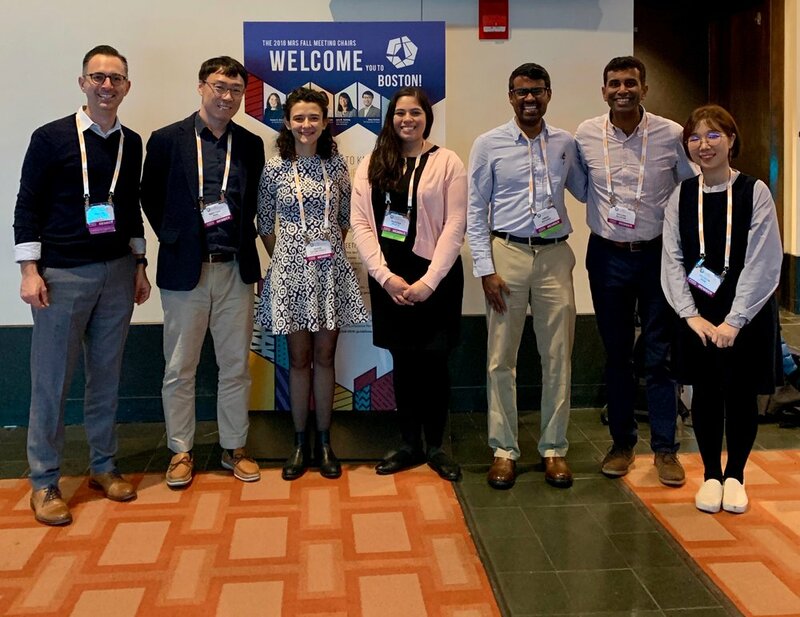 From left-to-right: Prof. Filler, Naechul Shin (Inha University), Gozde Tutuncuoglu, Maritza Mujica, Amar Mohabir, Saujan Sivaram (Naval Research Laboratory), Hyewon Shim (masters student in Naechul’s lab).